It has been a great month for the Snickerdoodle Sunday. Every week this party gets bigger and bigger. For the Fourth of July weekend we have decided to place the Snickerdoodle Sunday on a holiday break. Since we are on a break we decided to share with you each of our top 5 picks for the month of June. It was so hard to pick 5 of my most favorite. I love everything that everyone links up. I spend many hours going to each link every week checking out everyone's favorites. Finally after many hours of thinking about it and going back and forth from the last four parties. I finally have came up with my top 5 picks. Don't forget if your post has been featured, grab the button below and display it proudly!!! You deserve it. With the Fourth of July being this weekend. I have found myself pinning lots of fourth of July pins. Want to see what I have been pinning to my fourth of July board on Pinterest? (Click Here). While you are there, just go ahead and hit the follow button, so you don't miss anything I pin. 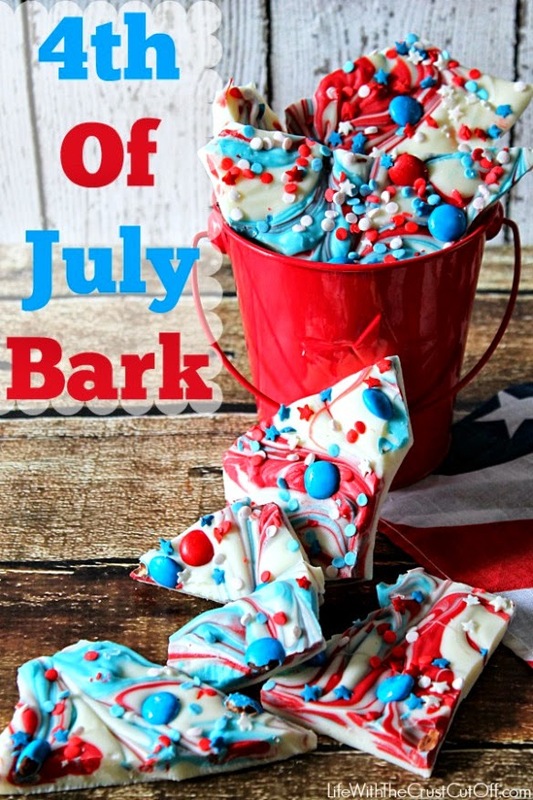 I just could not help myself to drool over the the 4th of July Bark that Parrish from the Life with the Crust Cut off linked up. I love peppermint bark at Christmas time. So why not try adding red and blue sprinkles and M&M's for a Fourth of July special treat. 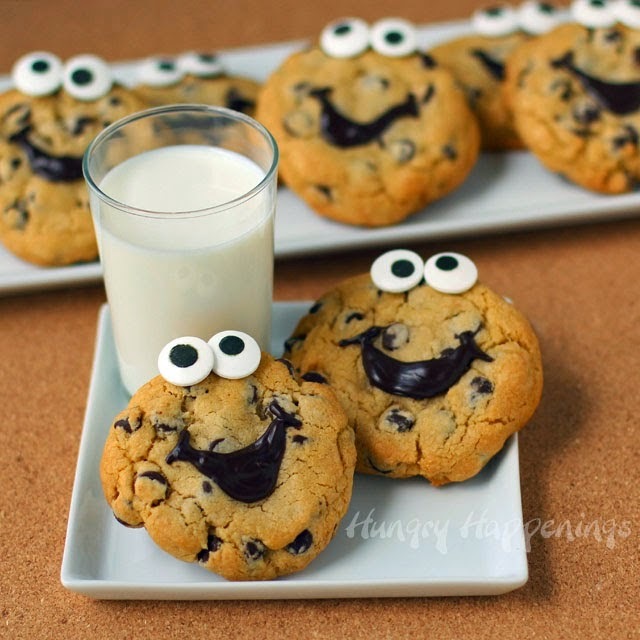 What child would not like eating chocolate chip cookies that look like this? 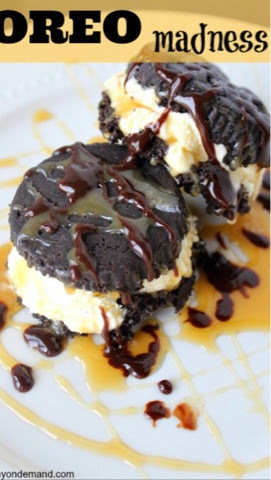 What a great way to end the day eating a smiling Chocolate Chip cookie or an Oreo Madness and drinking a big glass of milk. I love hanging wreaths on my front door. I think a celebration balloon wreath is so cool. 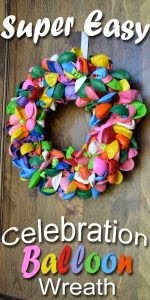 You can hang this wreath for the whole birthday month or just the day. It was hard picking out my last favorite. 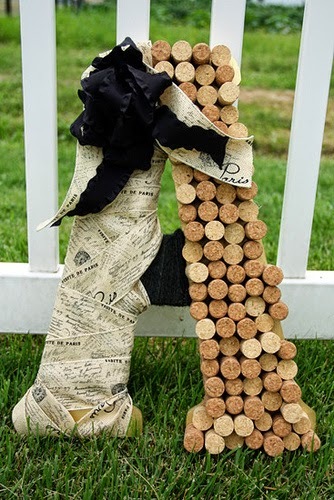 I had to go with the initial that was a personalized Initial with wine corks, burlap and Jute. I have seen many things made with wine corks. I am not a drinker so I am wondering if I could just buy some wine corks somewhere, so I could make my family initial. I can not stress how much I love everyone's posts. Don't forget to swing by 2 Crochet Hooks and Meatloaf and Melodrama and check out their top five picks. Please let your friends know about the Snickerdoodle Sunday and keep posting. Thank you all. I hope everyone has a safe and fun Fourth of July if you are in the States. If you are not in the States have a wonderful weekend too.